Coming into the grand final series, nine of the past ten champions have gone the way of the team with the home court advantage and 29 of the last 32 grand final matches had been won by the team with hosting duties. That didn’t change across the weekend, with the Wildcats beating United 81-71 at RAC Arena on Friday night before Melbourne hit back impressively on Sunday at Melbourne Arena winning 92-74. 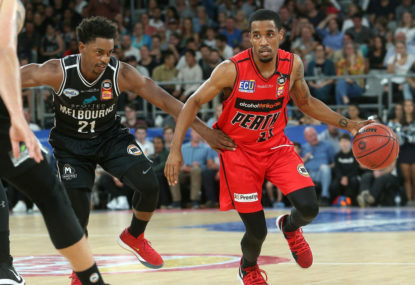 Both games had tight first halves, with Melbourne leading 33-29 in Perth on Friday at the break and then up 42-41 on Sunday before the home teams took over in the respective third quarters. The Cats scored the first 11 points of the third quarter on Friday night and went on a 16-2 run to blow the game open. Melbourne could never quite get back into it. United’s 71 points was their lowest score of the season. 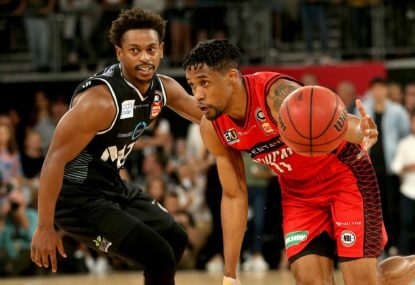 It was a similar story in Sunday’s Game 2, with Melbourne turning its one-point half-time lead into a 12-point lead in the blink of an eye before going on to hand Perth its biggest defeat of the season. So we aren’t too much wiser two games into the best-of-five series, with both teams showing what we already knew. That was that they have significant home-court advantages and it’s going to take quite an effort for one of the teams to win on the road. The Wildcats still have two of the three games left in the series in Perth, so they can win the championship without having to win in Melbourne on Sunday provided they hold court again at home on Friday. But for Melbourne, if they want to win the championship and go back-to-back, they have to win in Perth either this Friday in Game 3 or the following week in Game 5 if both teams split this weekend’s matches once more. The atmosphere for both games was fantastic as well, with 12,490 at RAC Arena on Friday night and another 10,062 at Melbourne Arena on Sunday. They were the highest attended first two grand final games since 1997. The other thing that stood out in both games was that the winners were better served by having an even spread of contributors and not relying on their superstars, as good as Casper Ware and Bryce Cotton are especially. Perth won on Friday despite Cotton scoring just ten points and going 4-16 from the field and 0-9 from deep. 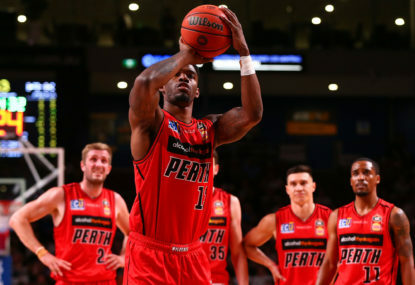 But he set his teammates up well with eight assists as Terrico White scored 19 points, Angus Brandt 14, Nick Kay ten, Jesse Wagstaff ten, Damian Martin eight and the returning Mitch Norton seven. Then, on Sunday in Melbourne, Cotton top-scored for Perth with 19 points but didn’t receive enough support outside of 17 points from White. Melbourne got 19 points from Ware on Friday and 15 from Chris Goulding, but only DJ Kennedy’s 11 points of which eight came before half-time. Alex Pledger’s nine points gave some support. That changed on Sunday on their home floor. Ware didn’t have a good shooting game but still had 14 points as did Goulding. But it was the others stepping up that made the difference with Mitch McCarron scoring 13 points, Kennedy 12, Dave Barlow 11, Josh Boone ten and Pledger eight. Rebounding was the other huge difference in Game 2. With Perth centres Brandt and Tom Jervis only playing a combined 23 minutes for five rebounds, the Cats played small ball and were punished on the glass. Melbourne finished with 20 offensive rebounds for 18 second-chance points while outrebounding Perth 51-38 and finishing up taking 12 more shots and five more field goals as a result. United coach Dean Vickerman couldn’t have been happier with the way his team bounced back to win on Sunday with a dominant rebounding performance as he looks to replicate that performance in Perth. “It was a good response,” Vickerman said. “The areas we identified were to take care of the ball and rebounding, and I was especially so impressed with the way we rebounded. “Our defence was pretty locked in all game too and our ability to stick to our rules was a credit to the boys and our assistant coaches who did a great job with the scout. “We think we can replicate it in Perth, we have to win one over there to win the championship so we have to believe that we can do it. So many factors go into how we try and do it a little bit differently and I think we can make some little adjustments in the way we set ourselves up for the week. 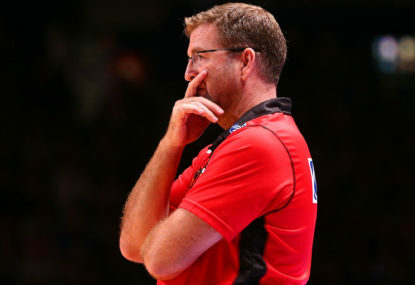 Perth coach Trevor Gleeson could accept being outplayed, but not the way his team was outworked on Sunday. “It was a pretty disappointing second half for us,” he said. “Our defence went missing there which is our bread and butter. “They scored 50 points in the second half and we know they are an explosive offensive team that can rack up points pretty quick, but it looked like we had feet in mud, we weren’t rotating and weren’t getting in a good position to help each other. Our defensive transition let them get runouts too. “I don’t think we had enough desire to get the ball either, which is disappointing to be in this finals environment and getting outworked. To beat Melbourne in Melbourne you’ve got to get those things. Wildcats captain Damian Martin is confident his team can turn around the things that went wrong on Sunday. “The beauty of it is that it is stuff we can fix,” Martin said. “Rebounding comes down to skill, desire and shooting predictable shots so you can get yourself in a position to go and rebound. “To give up 20 o-boards is a horrible number and I feel like they converted a lot of those, whether it was open threes or put backs. “Then they outrebounded us with defensive boards, which led to their transition points and Mitch McCarron in that third quarter got out and run, then their shooters were spotting up.